You all know Steve Rogers, AKA Captain America, founding member of the Avengers, and a bonafide super soldier with a rough chip on his shoulder. Well now we can see what he would’ve looked like if he was a girl. Thanks to the blonde fangirl in this picture, we can stretch our imaginations into a wonderful place where we not only get to look at the girl of our dreams, but also be impressed by her larger than life supernatural talents. Here’s one superhero who many fans didn’t know until she showed up in Avengers: Age of Ultron – Wanda Maximoff, the Scarlet Witch. Fans who had read the comics obviously had already heard all about her, but those that were only familiar with the films were quite pleased to see this telekinetic genius getting in the action, no less because she was being portrayed by the talented Elizabeth Olsen. 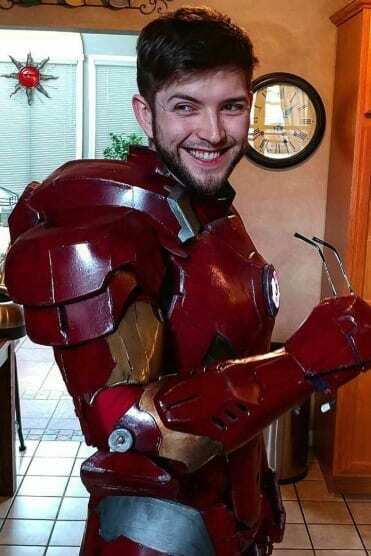 If this costume doesn’t do it for you, the movie version definitely will. 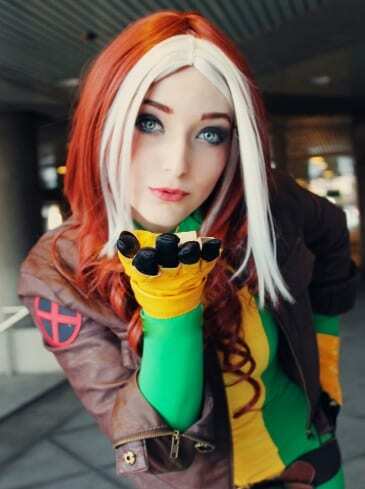 Before you get swayed by the kiss this young lady is blowing toward the camera, we suggest you take heed of the Marvel character she is dressing up as – Rogue. For those of you who aren’t familiar with X-Men, Rogue has a certain genetic condition that makes it impossible for her to touch anyone without sapping incommensurable amounts of energy from their body. That being said, we can see how it would be hard to resist the temptation with her. Here we have yet another Marvel character who those who didn’t read the comics only recently got to know. Her name is Mantis, and she first appeared in Guardians of the Galaxy Volume II. She is an empath, and possesses the ability to not only sense the feelings of others, but also to alter them as well – a talent that puts her in a unique relationship with everyone she meets. We have to say, this girl rocked her costume magnificently – we can barely tell her from the real one. Spidey has had a solid amount of love interests over the years – but everyone knows that his one true love was always Mary Jane. Even with all of that crime fighting, he still finds time to acknowledge the romantic butterflies in his stomach, and she’s always managed to summon those feelings for young Peter Parker. Of course, the two lovebirds in this picture aren’t the REAL Spiderman and MJ. But we gotta say, they’re doing a great a job selling it. 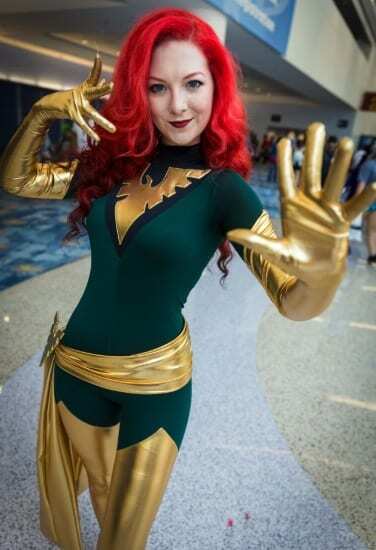 Fans of the comics won’t have a hard time figuring out who this is – Jean Grey, also known as the “Phoenix.” X-Men fans who watched the movies are well aware of this character, but they may not recognize her here because she has yet to wear this costume in the movies. That being said, anyone who knows anything about X-Men knows that Jean is perhaps the most powerful mutant out there – whenever she gets unleashed. 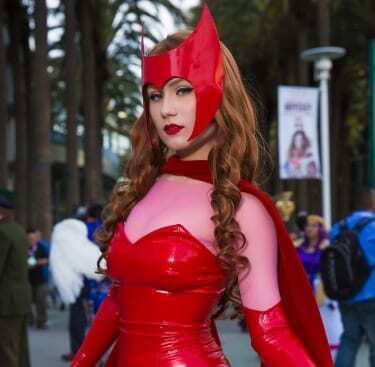 Every single X-Men character has always had a signature costume, and for the purpose of this article, it has helped us distinguish who these lovely young ladies are dressing up as. This particular girl is dressed gracefully as Kitty Pryde, a young mutant who is also sometimes known as Shadowcat. With the ability to walk through walls, she’s a prominent member of the comics, and also appears in X-Men: The Last Stand, where she is played by actress Ellen Page. You can’t really go wrong when it comes to Thor. And once again, we have ourselves a big strong male superhero who is portrayed magnificently through costume by a young blonde. 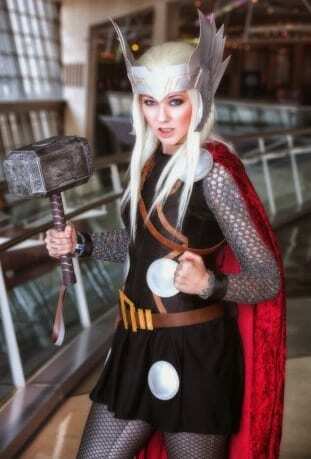 We have to say, it can’t be easy to dress up as a demigod, especially one who wields a hammer as important as Thor’s. But this girl seems more than up for the challenge, with an expression that lets us know she is ready for battle. We’re going to have give you a bit of a spoiler here, unless of course you’re like us, and you already know what we’re about to tell you. 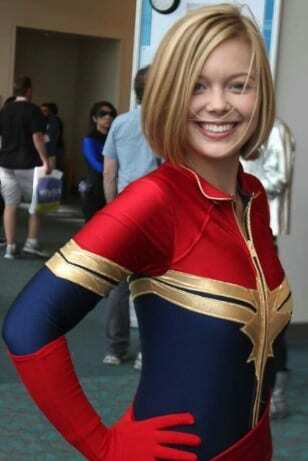 There is a brand new superhero coming to the Marvel Cinematic Universe, and her name is… wait for it… Captain Marvel! She will be portrayed by actress Brie Larson, and Marvel fans are super stoked about it. But until that moment she appears on screen, you can see that some fans just couldn’t handle the wait, and dressed up as her anyway. Can there possibly be a better mirror pic in existence? We’re not sure it’s possible… A woman who looks as stunning as this shouldn’t be allowed to dress in a Spiderman costume. All crime would cease to exist, and the police would be out of jobs. All jokes aside, this girl seems to be doing a bit of a Spiderman-Mary Jane combo, given the fact that she has some of most vivid red hair we’ve ever seen. It certainly goes well with her suit. In 2014, Marvel Studios introduced the world to Guardians of the Galaxy (or at least the ones who didn’t read the comics), and we were all happier for it. This new world included a handful of vibrant and dynamic characters, such as Gamora, a trained combat warrior who also happens to be the daughter of Thanos and the sister of Nebula. 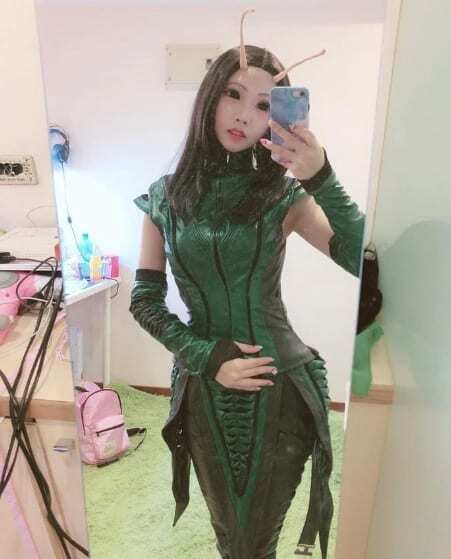 We can’t imagine it is easy to render your skin green, but this young woman was impressively committed to her costume, and we applaud her for that. When it comes to the Avengers, or just Marvel in general, you can’t go far without talking about Tony Stark, AKA Iron Man. A primary founder of the Avengers and heir of tech giant Stark Industries, this is one man with a plan. He is the epitome of cool, and the guy in this picture understands that well. Flashing a million dollar smile and holding his shades, he’s well aware that in order to emulate Stark, he’s got to do so in style. Yet another “woman dressing up as a man” situation, and yet it is no less awesome in this case either. 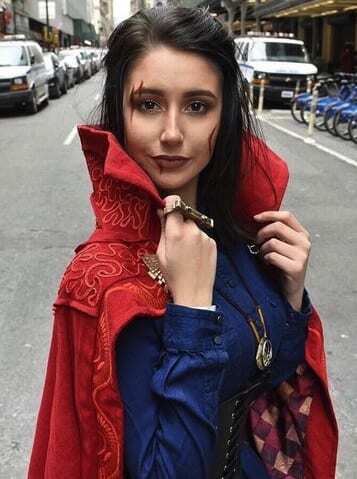 Here we have a young lady who’s made the brave attempt at dressing up as Doctor Strange, the man who can teleport through time, space, and alternate realities. Indeed, Doctor Strange has always had a certain mystique about him, which tells us that this girl is probably not so different. In fact, tell her to give us a ring if you meet her on the street. When it really comes down to it, the X-Men are special because of the way they are a team. They stand by each other through and through, and one mutant who seems to pop up everywhere is Logan. Also known as Wolverine, he has a very murky past, along with a condition where he doesn’t age, heals instantly, and sprouts adamantium claws on demand. 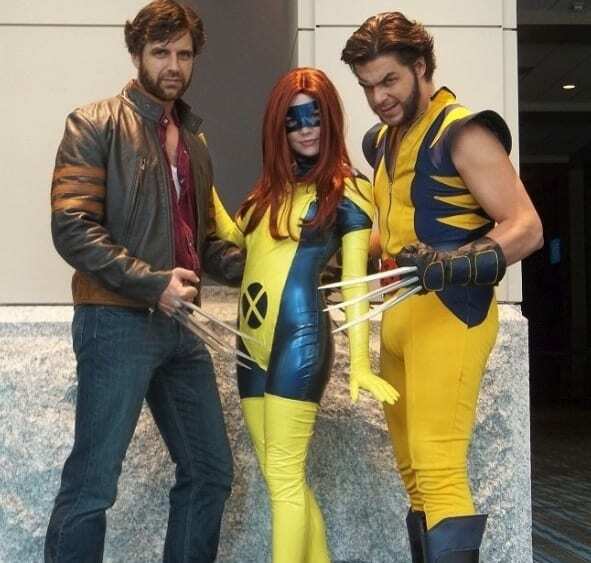 In this picture, we’ve actually got two Wolverines, and a Kitty Pryde hanging out in the middle for good measure. 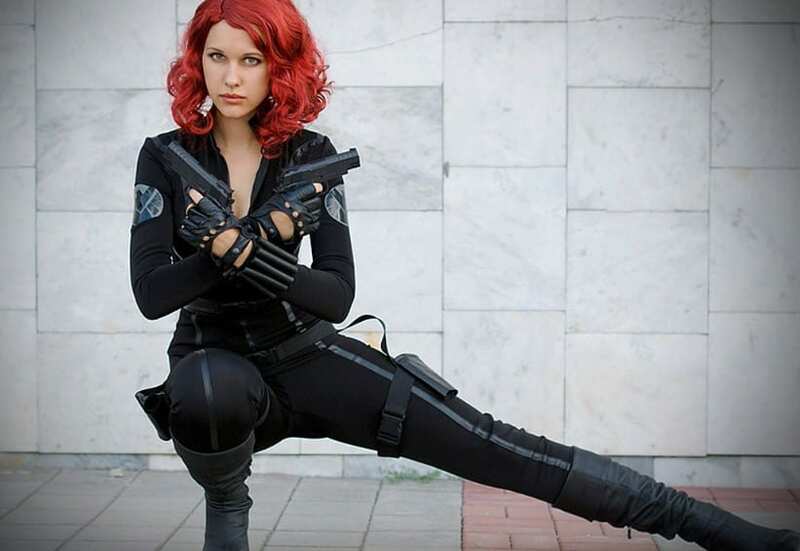 Black Widow is one of those Marvel characters who just captivates you from the moment you lay your eyes on her. Played in the films by Scarlett Johansson, this trained assassin has a rocky past but has built her life back together in the form of teaming up with the Avengers. We have to say, we didn’t think we’d find a costume this good, but we’re pleasantly surprised that we did. Natasha Romanoff is ready for action, ladies and gentlemen. The Marvel film that these characters are based off of may not be the most popular, but it is a gem under the radar that you must check out when you have the chance, if you haven’t yet. 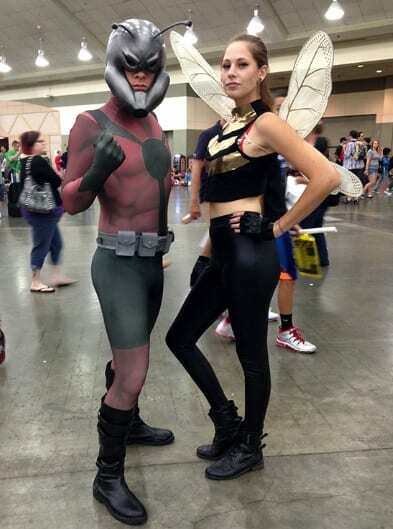 The two characters here are Antman and the Wasp, who are played, respectively, by Paul Rudd and Evangeline Lilly. They do an outstanding job portrayed the supernatural crime fighting insects, but these two seem to be doing pretty good as well. There is a reason they call this mutant Mystique – it’s because you truly never know when she’ll pull the rug out from under you, pretending to be someone she’s not. This is because she has the ability to change her appearance at will, an extraordinary talent, even for a mutant. However, in her natural form, she has blue skin, and this is clearly what this young lady sought to emulate. 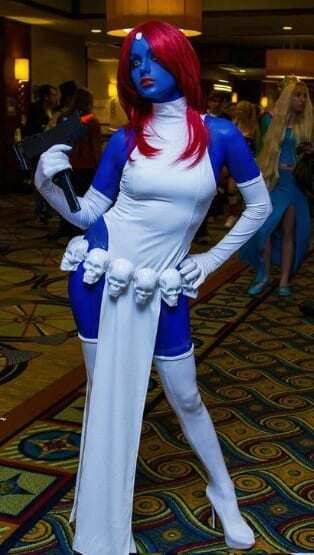 Mystique is also a deadly warrior, which makes her an additional threat on the ground. If there’s one Marvel character who one might say is the most impossible to emulate, it’s the Hulk. It’s easy to turn yourself green – but the Hulk is so big that any “normal-sized” human being couldn’t possibly hope to make themselves look like him. But have no fear, Hulk-lovers, because the task is still somewhat attainable. 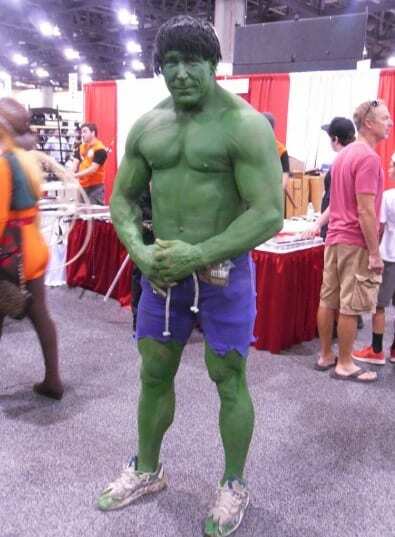 This man you see here was pretty jacked as it is, so after making himself green, he got about as close as one could get to Bruce Banner. We know that we’ve already done a “Dark Phoenix,” but this girl pulled off her costume so well that we just had to include her. Not only did she manage to put together an ensemble of colors that radiate vibrantly from every corner, but he also brings the attitude necessary to let us know that she means business. If there’s something we know about Jean Grey, it’s that she is not to be trifled with when she gets going, so we recommend getting out of her way. Perhaps one of the biggest and most pleasant surprises the Marvel films gave us over the last few years was Deadpool. The film was revolutionary in many ways, combining comedy, drama, action, (even horror), all bundled up into a quirky superhero film. Ryan Reynolds makes it his own, and even though we know it’s not him behind the mask in this picture, we commend this couple for making the effort to look as much like Deadpool as they possibly could. Considering the fact that the Wasp has only recently emerged as a fully fledged superhero (at least in the movies), we thought she deserved her own page, without being flanked by her Antman buddy. Of course, we also felt it appropriate because this woman looks simply radiant as she portrays the crime fighting Marvel hero. The Wasp is still relatively lesser known among the Marvel heroines, but mark our words – that won’t last long. Anyone who knows a thing or two about the Thor films may recognize the attire that this young lady has on – the kind that only a warrior of Asgard might wear. In fact, this girl is dressed up as none other than Lady Sif, a friend of Thor and his co-soldier in his battle for justice. 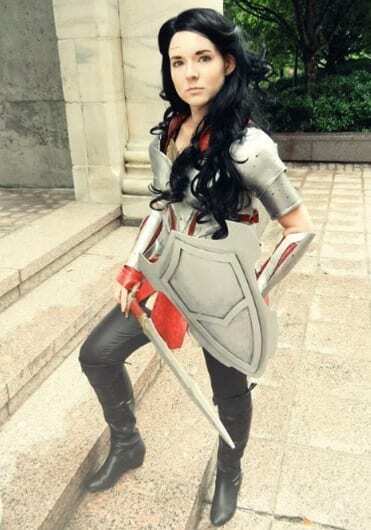 Empowering for women and men alike around the world, Lady Sif is an underrated fan favorite, and the proof is in the costume you see here. There is something special to be said about dynamic characters who go through a certain internal struggle before our eyes – and Nebula is one of them. From Guardians of the Galaxy up until Avengers: Infinity War, we see her transform her bitterness into empathy, and we end up understanding where she comes from in the process. 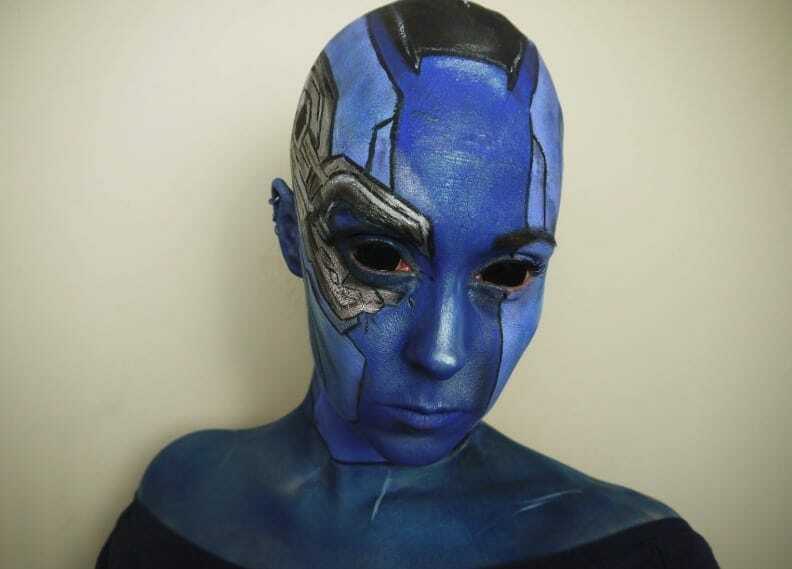 Character development aside, dressing up as her can’t have been easy, and this young lady absolutely nailed it in the intricate blue face paint department. Due to the fact that Mary Jane Watson is such an iconic part of the Spider Man franchise, comics and movies alike, we deemed it prudent to find another devoted fan who dressed up as her. The girl here really hit it out of the ballpark with her outfit, making Peter Parker seem like the luckiest guy in the world. It’s clear she’s a big fan of the wall crawling, friendly neighborhood Spider Man, with that heart-shaped of his plastered on her shirt. There were some who said that Storm didn’t get portrayed well in the X-Men films. Not because of Halle Berry’s acting (because let’s face it, she’s awesome), but because she didn’t have as many awesome scenes where she absolutely wrecks havoc with her thunderous abilities. That said, all fans of the comics know how menacing she really is, and this Halloweener certainly knows that as well with this killer costume. And are those authentic “Storm contacts” she’s wearing? Squirrel Girl may seem cute and fuzzy when you look at her at first. But making that assumption would be a huge mistake for anyone to make if they were about to head into one on one combat with her. A comic book fan favorite, Squirrel Girl AKA Dorene Green is one of the fiercest superheroes around, and she actually appears in a new cartoon series called Marvel Rising, starring actress Milana Vayntrub. Kudos on the costume! Yowza! Are there any other words to describe the captivating effective of this costume? Okay, perhaps there are a few, but you catch our drift – it’s just awesome. Fans of the X-Men film series will know all about Psylocke from her appearance in X-Men: Apocalypse, where she served as one of Apocalypse’s “Four Horsemen.” This girl’s depiction of her character is simply on another level, from her vivid purple hair to her shiny blue outfit. When the first Captain America movie came out, there were a few things that made it awesome. Learning the origin story of Steve Rogers, and following the romance between him and Agent Peggy Carter, played by the lovely Hayley Atwell. We all felt the heartbreak when his plane crashed, for although he survived, he was frozen for 70 years, and would never see Peggy again. This girl’s costume is so good that is actually makes us want to watch the movie again. “I am Groot, I am Groot, I am Groot…” You get the idea. Anyone who has any basic knowledge of Marvel’s Guardians of the Galaxy knows that these are virtually the only words that Groot knows how to say (and yet he still manages to communicate with his peers). As for this costume, isn’t it just grand? 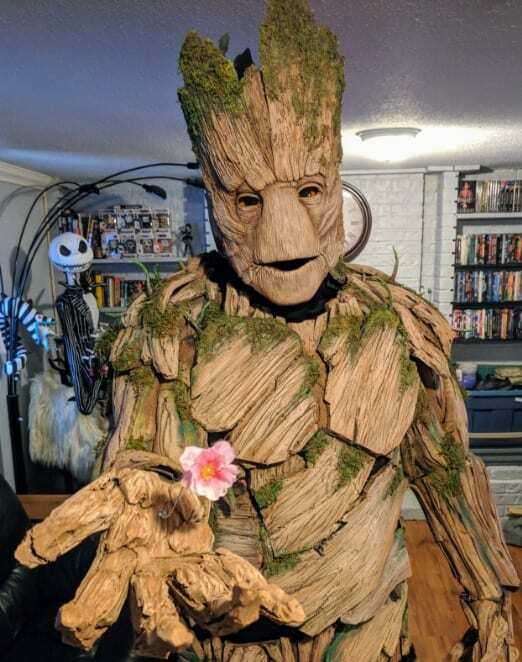 It’s practically flawless, and it actually inspires us to look for a Groot costume of our when Halloween comes around. Miss Marvel AKA Kamala Khan didn’t wasn’t born an Avenger – she had to work for it. She grew up on the streets of New Jersey and idolized Captain Marvel, along with many other Avengers. She would later acquire her own supernatural powers and join the Avengers as well, under the tutelage of her former idol, Captain Marvel. Kamala is yet another favorite among Marvel comic readers, and it seems we have another diehard fan right here. As the young lady in this picture stuns us all in her magnificent depiction of Emma Frost, we hope that she’s not attempting to read our minds in the process. This is because mind-reading is one of Frost’s superpowers, not at all unlike that of Professor Xavier’s. She appeared in X-Men: First Class, where she served as the right hand gal of the evil Sebastian Shaw – but readers of the comics are well aware that she has a well versed history. Ahh, good old Thanos. Actually, he’s not that “good” in the tradition good vs. evil sense, but he would try to convince you otherwise. Indeed, he says in Avengers: Infinity War that his agenda to obliterate half the world is purely for the sake of achieving balance. However poetic that may seem, it’s clear he is a massive villain that must be stopped. 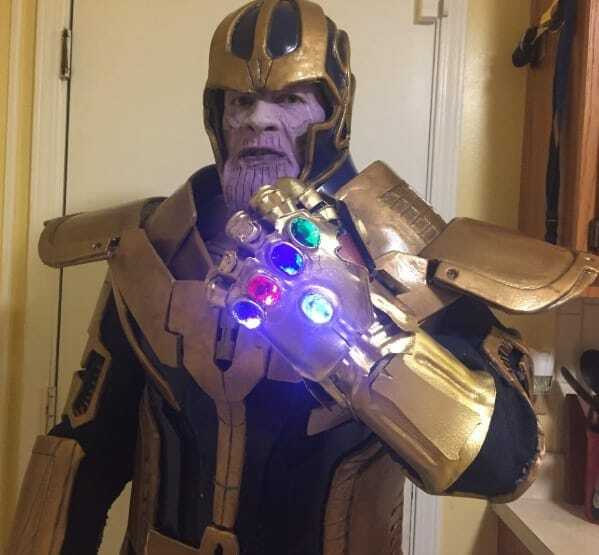 All that said, this dude’s costume is totally on point, so good on him for rocking it well. Here we have an interesting scenario. We wrote Gwen Stacy because this girl has blonde hair, and because she’s wearing a Spiderman-like outfit. Of course, Gwen isn’t actually Spider Man, rather she was definitely his girlfriend, or romantic interest, for a solid amount of time. Still, it’s not uncommon for girls to wear outfits that reflect on who their boyfriends are, right? In that sense, we totally understand the logic of this girl’s slick Spider Man costume. In second installment of The Amazing Spider Man, we were introduced to a young character named Felicia Hardy. Diehards of the comics knew that she was in fact Black Cat, and they were excited to see her appear. Everyone else was a bit more oblivious to this fact, considering she didn’t transform in the movie. However, Black Cat remains a staple in the comics, and clearly this young woman is a huge fan of the tenacious super-feline. In one of the most recent X-Men films, titled Logan, we discover that he (Logan) has a daughter. Her name is Laura Kinney, and if this picture hasn’t already informed you of this fact, she’s got adamantium claws just like he does. We won’t spoil the grand finale of the film, but needless to say it’s quite touching to see them connect as the film progresses. Although she’s younger in the film, this older girl awesomely displays the attitude of X-23 (which is her name in the comics). Like many of its MCU siblings, Black Panther was pretty darn popular when it came out. Considering it was released as recently as 2018, it’s still pretty fresh in people’s minds. 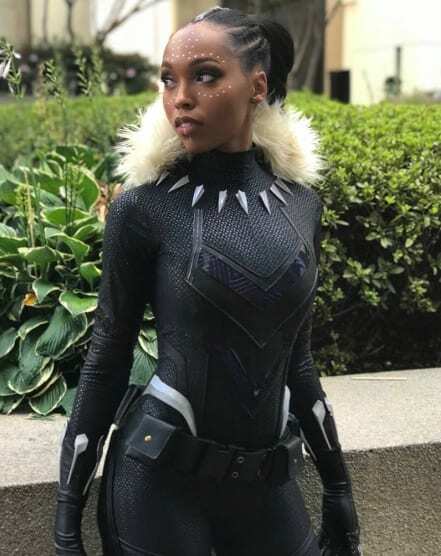 It seems that this girl decided to dress up as T’Challa, the heir the throne of Wakanda who was portrayed by Chadwick Boseman in the film. Her expression lets loose a seriousness that is consistent with T’Challa’s, and combined with the outfit, the effect is on point. Also known by many as “The Invisible Woman,” Sue Storm is one of the heralded Fantastic Four. She is the sister of “Human Torch” Johnny Storm, and the love interest of Reed Richards AKA Mr. Fantastic himself. Obviously this woman couldn’t turn invisible (because of obvious reasons), but the “real Sue Storm” can on demand. Oh yeah, and she also has the ability to generate powerful force field around her, adding to her versatile repertoire of talents. We take it you’re not sorry that we brought back Mary Jane for yet another time, because this girl right here looks simply sensational. Mary Jane as never looked more perfect for Peter Parker, and we really hope he doesn’t have to fight the Green Goblin for too long, so that he can make it home in time for a good quality dinner and a movie. For any of you out there who thought red heads weren’t your type, do you still feel that way now?